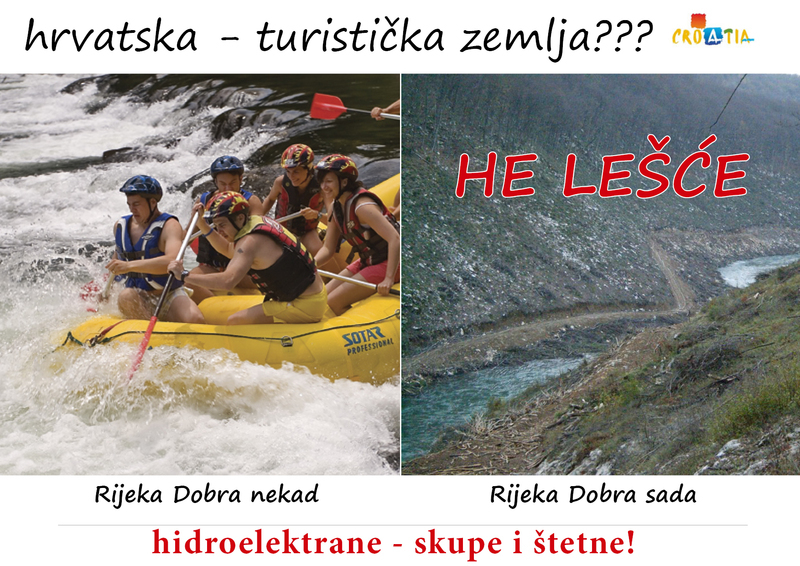 HPP Lešće vs. Tourism - Before and after construction of HPP Lešće, tourism capacities of the region are considerably lowered. HPP Lešće on river Dobra continues operating despite of the fact that it has caused many negative environmental impacts as it has been brought to the attention by the civil society organisations. Hydropower plant Lešće on the Dobra River in Croatia started operating in 2010. It was the first HPP built in Croatia after it became an independent state. As the plant would have capacity of 1% of total Croatian electricity demand (according to politicians), building this plant was one of the steps towards energy independence of the state. The project had been coordinated by Croatian national power company Hrvatska Elektroprivreda (HEP Group), while the plant was built by consortium of three Croatian companies (Končar Inženjering za energetiku i transport d.d. ; Ingra d.d., and Konstruktor Inženjering). The capacity of the HPP Lešće is 42.3 MW, it produces 98 GWh per year. The Croatian Government claimed economic viability of the project as it would lower the amount of imported electricity with an estimated cost of 14 million of USD per year. 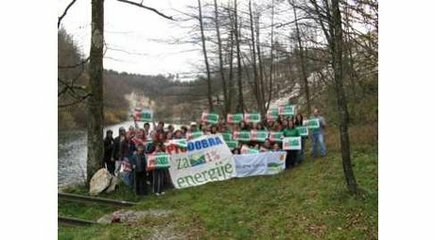 In 2006, when construction work on the HPP begun, Croatian environmental organizations claimed the project would destroy of 13 km of River Dobra Canyon- fragile karst ecosystem. In order to stop the project, NGO Zelena Akcija (Green Action) organized the signing of the online petition and sent a protest letter to the Croatian Government. The NGO main argument was the fact that the project's EIA was elaborated 20 years ago, and it proposed investments in tourism activities (e.g. canyoning) instead. The local government supported the HE project considering it of great importance for the development of the region, and a source of income from the taxes paid by the HEP Group. Furthermore, local communities were satisfied as new roads have been built and water piping system installed as a part of the project. In 2012, two years after launching HPP Lešće, NGOs Pan- Karlova and Zelena akcija, fishermen, recreational users and local people reported following impacts HPP on the environment: lower water temperature negatively impacting fish reproduction; soil erosion; and flooding of surrounding fields in creation of small accumulation. NGOs pointed out that HPP produce only 1% of total electricity produced in Croatia was not enough to justify destruction of the natural area previously proposed for Natura 2000. They also asked for respect of the Law on Environmental Protection from 2007, which does not allow construction if the relevant studies of EIA are older that three year, and have demanded elaboration of the new one. The NGOs added that project contractors have used of interim period between two Environmental Laws to legalize the project. Moreover old EIA was not available to the general public. Finally, the opponents of HPP Lešće demanded from USKOK (Bureau for Combating Corruption and Organized Crime) and DORH (The State Attorney's Office of Republic of Croatia) remediation of the damage caused by the project, arguing even for demolition of the dam due to the great amount of negative effects it provoked. Nowadays, HPP Lešće continues working regularly. Project Details HPP Lešće is located close to Toplice Lešće, while parts of its construction and reservoirs lay in the area of Generalski Stol, Bosiljevo and Ogulin. The HPP Lešće has power of 42.3 MW and annual capacity of 98 GWh. The accumulation lake covers an area of 146 ha, it is 12.61 km long and has a volume of 25.7 million m3. The dam is 176.5 m long, 52.5 m high and 4 m wide. Development of Alternatives In 2006, NGOs demanded stopping of the project, without any success. After two years of HPP operation, in 2012, the NGOs demanded recuperation of the damage caused by the project, arguing even for the dam demolition. The organisations called for respect of the new Law on Environmental Protection that accept only EIA studies not older that three years. Why? Explain briefly. The HPP Lešće continues operating. 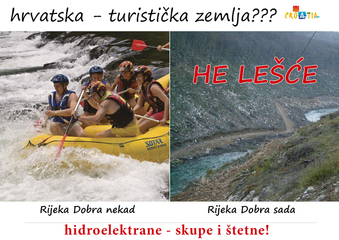 HPP Lešće vs. Tourism Before and after construction of HPP Lešće, tourism capacities of the region are considerably lowered.